I opened my office window the other day to find a row of tiny earthen mounds, little bubbles separated by straight walls. 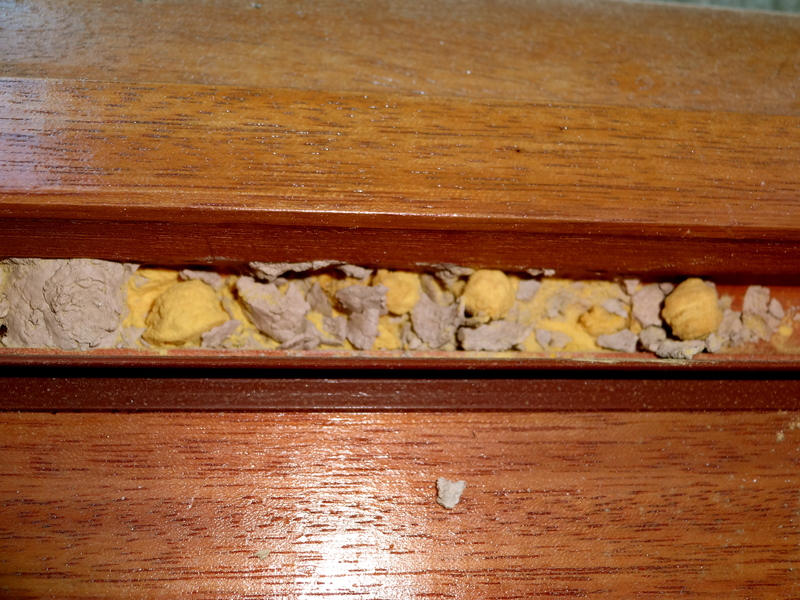 I thought it was an odd collection of dirt that had blown in through the small ventilation hole in the wooden frame. Or maybe a small ant colony, since we get a variety of ants on the out of our old stone house. They like the vines, and we don’t mind the ecosystem of insect, bird and reptile life those vines support – including the ants. As long as they don’t come inside. A dazed carpenter bee, covered in pollen, in the nest it was building in my office windowsill. I started to scrape out the mounds with a pen, only to uncover a dozy bee blanketed in rich yellow pollen. The mounds were a nest for the small carpenter bee, a solitary, wild pollinator known for boring holes in soft woods. 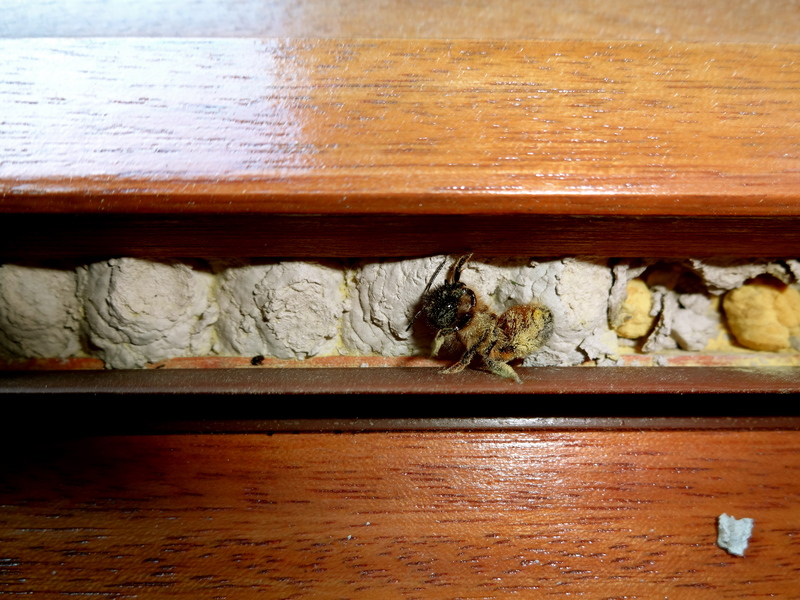 Of course, this was a small variety of carpenter bee, and she had fit right into the ready-made ventilation holes at the base of our window frames. The bee shook itself and then flew off. When it didn’t return after a few days, I cleaned out the nest. The bee flew off after a moment, abandoning the nest. Each cell had its own ball of pollen, which would have fed one individual bee. Carpenter bees are important wild pollinators, and many farmers encourage their presence even if, like me, they don’t necessarily welcome their nests in the structure of homes. 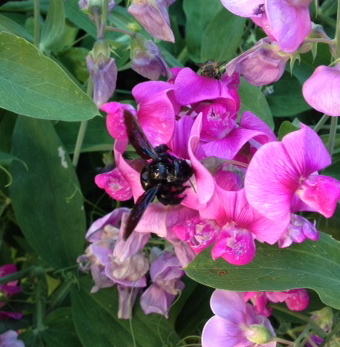 Another common carpenter bee in our area looks like a giant black bumblebee – harmless, heavy, loud and a bit dopey. I saw this one while out running, happily mining sweet pea blossoms for nectar. This big carpenter bee was very photo shy, flying off whenever I aimed my phone camera, returning when I looked away. Then we found two lifeless bees in our garden. No visible damage, just not alive any more. Bodies intact, it’s like they just stopped flying and died. The United States has announced the creation of a USD 8 million-funded ‘honey bee task force‘ to examine why the U.S. honey bee population has been in severe decline since 2006. We could quibble as to why a pollinator that is necessary for the reproduction of many U.S. food crops and adds an estimated USD 15 billion to the economy (according to the U.S. White House blog) hasn’t deserved a task force of its own for years already. Or I could muse upon the minuscule investment being made in the honey bee in comparison to its overall economic value, not to mention its environmental impact. I could mention the recent reports showing that neonicotinoid pesticides in use around the world have been conclusively linked with honey bee declines, which might explain why these pesticides are currently banned in the European Union. These pesticides are now considered to carry the same level of environmental and health danger as the notorious dichlorodiphenyltrichloroethane, better known as DDT. Those who argue in favor of neonicotinoid use point to the increase in the use of older pesticides in their place. Or I could shake my head at articles, almost invariably found in business publications that cite industry-funded studies, that refute connections between neonicotinoids and bee decline in favor of an array of other causes, most of them not linked to large corporations nor to the global multi-billion dollar industry that neonics support. The producing companies are never mentioned by name (for the record, they’re Monsanto, Bayer and CropScience). 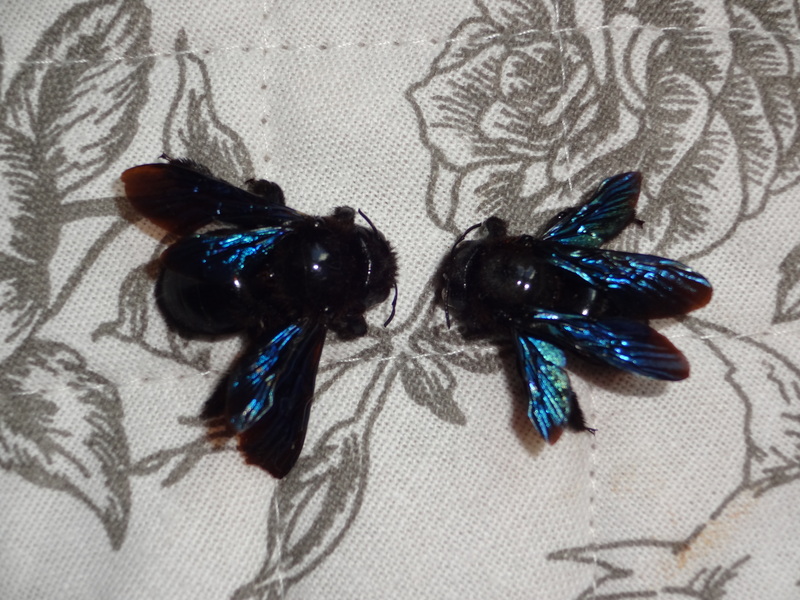 Carpenter bees: The violet-blue of their wings is dazzling. What I can say is this: Few studies examine the effects of these pesticides on the decline in wild pollinators like the bumblebee, or the carpenter bee. The much-touted, lately-arrived U.S. task force will not be studying these issues either (not that the funding would be sufficient for that, in any case). Nor do I see a task force anywhere on the more judicious and limited use of pesticides in favor of best practice techniques. So this year, I’ll be putting out a few havens for carpenter bees and planting a few more flowers that they like. And this year, as every year, I won’t be spraying any pesticides in my garden. How lucky you are to find the nest! They are such beautiful creatures. The US taskforce will probably focus mostly on honeybees, because they are the breadwinners for agriculture – wild pollinator education still has a long way to go! But people are working on these studies now, and the evidence should make it hard for people to keep using these chemicals. This study (http://onlinelibrary.wiley.com/doi/10.1111/afe.12041/abstract) specifically looked at how neonics affect solitary bees, others have shown how they also affect non-target wildlife like birds. The IUCN has already beat the US to a pesticide taskforce – some of the results were published this week. Suffice to say, there is nothing good to say about pesticides. Thank you for not spraying!